You should have an effective SEO strategy in place if you wish to make your website a cut above the rest. Google’s algorithm is changing continuously so what works today may become obsolete in the future. Good web content, credible links, social presence etc are all important from the point of view of a good SEO strategy. You can showcase your website in a better way, thanks to the presence or arrival of social media platforms. Social media complements SEO efforts positively since it can play an important role in determining the way sites are ranked on search engine results pages. ► How do social media affect SEO? ► How to integrate SEO and Social Media? You can make more people to talk about your site and thereby make your presence felt on social media. Engaging with the audience and sharing content with them can also boost your website’s presence. Sparing just a few minutes with your audience everyday can go a long way in helping your site get better rankings. Since you can interact with tons of thousands of people every day, you can build the value of your brand with the help of social media. You can get more likes and more customers by using such resources online. a) The descriptions and profile name should be linked to your business name. Similarly, the URL and username for both sites should be linked to your business name. b) Your profile page on the social platform should ideally match the appearance or layout of your website. c) You should take efforts to create and post professional content on your site regularly. The content posted should be such that it can meet customer’s demands. Your web page/site must to be simply accessible. The web pages should be created in such a way that it has a share option. You can include all the important networks such as Twitter, Google+, Facebook and install programs such as ShareThis so that your consumers can share whatever they like instantly. Merely having a presence on major social platforms cannot help you get maximum traffic to your site or blog. You should enable more and more people to read and share your content to drive extra traffic to your website. You can begin by getting more information about the social behavior of your target audience. You can find out the type of videos your customers like or the social platforms they prefer the most. This can help you put the best strategy in place so that you can attain your business targets. From the angle of good SEO, it is crucial to have your presence in Google+ since this can help you to help you to build a good rapport with a wide range of people by integrating your personal contacts. A good SEO approach can help you to get the best ranking online by optimizing your content. As more and more companies compete with each other to get improved rankings, social media is also playing a vital role in helping them achieve their goals. These days search engines make use of social platforms/values such as tweets, shares, Facebook and others. The most important thing is integration. 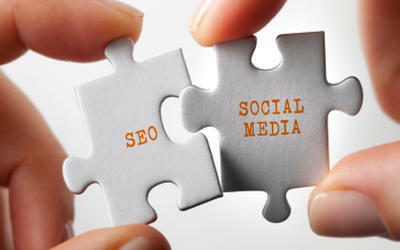 By integrating social media with SEO you can ensure that your site will get improved rankings. A good content strategy is the most important tool when it comes to integrating social media and SEO. By combining the content and marketing efforts into one organized plan, you can hope to achieve the targets you have set for yourself in the first place. 1. You can generate suitable content by keeping a tab on the keywords that drive traffic to your website. You can find out more about the types of keywords to use by using freely available tools such as AdWords from Google. By using appropriate long-tail keyword phrases and keywords you can drive traffic to your website. 2. It will also be useful to research and find out more about the best social keywords to use. Free tools like SocialMotion can help you to locate the best keywords that are commonly used in social content such as tweets and comments. 3. You can create apt content by browsing through the social posts that are most popular. Paid tools such as Social Bro and free tools such as Facebook Insights can help you in this regard. 4. Depending on the industry you are employed in, you should take efforts to update your content regularly. Sharing the work of other people can also help you to boost your web presence. You should devote time and effort to interact with your audience regularly to get the most of our SEO efforts. An effective SEO strategy includes several key aspects namely creating relevant content with apt keywords, link building and social media activities. Actively participating on social media and managing content can go a long way in yielding the desired results. Providing links from your site to social profiles can also help improve your web presence and sales. By combining social media with your SEO efforts, you can create better awareness about your brand and engage or interact with your clients in a better way. Creating content that is user friendly and sharing the same through social media networks is found to be an effective way to generate leads and maximize profits for a business. Tapping the potential of social media and clubbing it with your SEO efforts can real rich rewards to business owners online. If your content is of a meager or no value to your target audience, then it can ripple a commanding message to search engines in regard to the ranking signal. Do you have any tips to get most out of SEO and social media? Do share your views in the comment section, we’ll be glad to hear from you. The Ethical Minefield Regarding Social Media Marketing ! Previous Post:The Ethical Minefield Regarding Social Media Marketing !